This cup is featured in the standard size range in a beautiful Amethyst purple color. 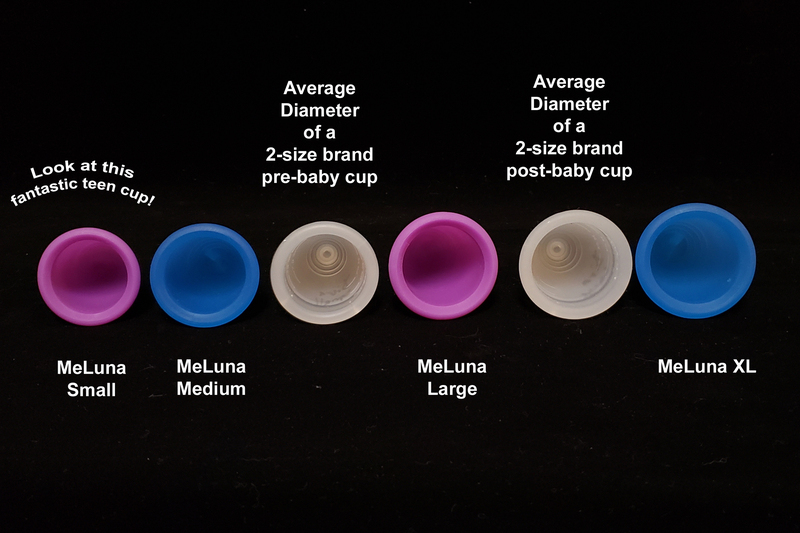 This is my third menstral cup and is by far the most rigid which helps with insertion. I purchased the one with a ring on the bottom to help with removal. I have difficulty with strength in my hands and needed something more substantial to get ahold of but it still is difficult to remove because I can’t break th “seal”. Overall I would recommend this cup over the others I have used and seen. After having my son, I could NOT tolerate the stem on my old cup. It hurt SO BAD, I think primarily on the scar tissue from my tear. I needed a ball stem cup and this one is wonderful so far! It was tough to get it to open the first few times I inserted it but it broke in quickly. Love it! I like the size, I like the ball tip, it is more comfortable than the stem, however, the material these are made of is was very uncomfortable during removal. I have very sensitive tissues since having kids, so the softer silicone cups I've tried in the past were better for me for removal. My search for the perfect cup for me continues. Very nice cup. It is softer than my diva cup so I find it easier to change more often. The ball on the end makes it so easy to remove! It can be a little more difficult to get into place because it is soft but once I got used to it I had no problem. Would definitely recommend! i wish i had purchased this cup so much sooner than i did & if i had the funds, i would (anonymously) mail one to damned near every woman i know. i have now used the cup during 2 cycles. the first cycle was a "normal" one for me; meaning i was miserable, but at home. the second cycle was during an intense 10 day appalachian trail hiking/rock climbing/camping trip. i hiked/camped a different portion of the trail last summer during my period & i have to say, this year: GAME CHANGER. i have a heavy flow, but like a tampon, i can instantly "tell" when the cup needed to be emptied. while on the trail, i experianced a more extreme usage situation & i came through great. as a newbie, i am very happy to have chosen the ring option, it gave me the confidence i needed. This was a really great first cup, it was easy to insert/remove and also decently comfortable. It's pretty firm, which isn't ideal to sleep in, but I hardly noticed it during the day and it allowed me to do everything I normally would. It was also comfortable to work out in and I didn't have any problems with it or worries about it. I would recommend. I think I was using the wrong size at first, so I changed sizes. I think it improved, however I still had leakage. This might be because I am still new to the cup and an amateur, but it is definitely not intuitive and requires some practice. 4.5 stars- I like the shape and the ball-shaped handle. It's extremely comfortable, though I think I may want a slightly larger size- the capacity is smaller than I had expected.